I had the opportunity to try out Viewranger’s “GPS app for adventure” over the past couple months and wanted to share a bit of my experience with you, the backcountryskiingcanada.com community. Viewranger is an easy to use application that turns your smart phone into a fully functioning GPS, at least when you’re in cell range. With that obvious limitation, the true beauty of View Ranger isn’t the application itself – which could be improved for front/backcountry skiing (more on this later) – but rather the remarkable licensed database of topographic maps available for purchase. Viewranger not only uses open source web maps available on many similar mapping applications, but also detailed government-issue topographic maps that are available for purchase. Why is this a benefit? 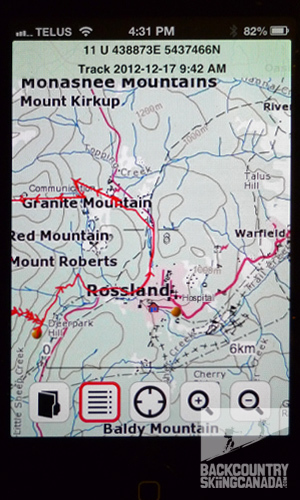 The user can download maps onto the mobile device and view them when out of cell range, providing the same information you would have in a regular topographic map. You can even plan and plot tracks on the maps before you depart for use in backcountry settings, regardless of cell coverage. Mobile device display of your route. On-line view of your route. When in cell range, the Viewranger is essentially a fully functioning GPS with better functionality than many GPS’ I’ve used. You can plan, plot, navigate, track, locate, record, be guided, analyze and share your outdoor adventures. Currently Viewranger offers detailed topo maps for 14 countries around the world and is expanding its database all the time. This can save a lot of effort in sourcing topos for destinations around the world, all in the convenience of your mobile device regardless of having cell coverage or roaming fees. The Canadian map is 1:50,000 scale. Another cool feature, though admittedly I haven’t used it yet, is the “Buddy Beacon,” which allows you to track the location of a buddy with the same app installed and running on his phone. This could be useful in numerous ways, be it knowing where friends or family are on the ski hill to search and rescue purposes. As for the application itself, it wasn’t designed for backcountry skiing specifically and has a few limitations. Most notably, you can’t track number of runs. With some playing around in Trip View mode, I managed to unlock some of the other settings such as total vertical gain/descent, max speed, maximum altitude, etc. These are basic functions – and often desired – of other skiing-specific applications. Hopefully View Ranger can consider looking at “modes” in future versions of the application for specific activities to make this more intuitive. Overall, Viewranger is fairly intuitive and straightforward…and after all, who wants a complicated phone app while fidgeting with cold fingers? Not enough can be said about having a detailed topo map in your pocket regardless of where you are (I have all of North America on my phone). And continual access to UTM coordinates and Latitude/Longitude is invaluable should you find yourself in a sticky situation (read: getting help quickly). Viewranger also has a rapidly expanding community of users who are continuously posting new routes, Geocaches and other points of interest if you’re into that kind of thing. And of course you can upload your own adventures if you’re not concerned about divulging your secret stashes of powder. A word of caution should be noted here: if you are tracking a route with the phone GPS and application open, it can drain the phone’s battery life relatively quickly. If you are in slack country and aren’t as concerned about the battery life, no biggie. However, if you are on an extended backcountry trip it is advised to maintain maximum battery life in case you need it in an emergency (or bring an extra battery or charging device). In no way can this replace the value of having a compass and map if you’re venturing into the wilderness. - Magnetic compass integration (where supported on phone). 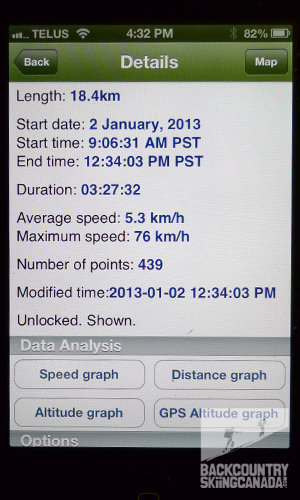 - Record trip stats like time, distance, speed and max speed. Lots of Map options and detailed tracking information. Text based results and graphical output. Overall, the Viewranger is a useful tool if you just want to record laps on the ski hill, track a ski tour and as a navigation device, particularly when you’re sure you’ll be in cell range and the mobile device’s GPS is functioning. Even out of cell range, it’s nice knowing I have all the topos I need in my pocket when I’m unsure of route choice. I have used this more than once in whiteout conditions and it proved useful. 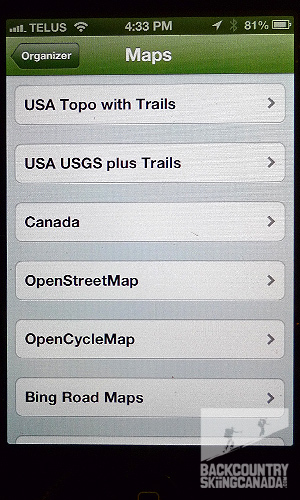 And for a mere $15, I have all of the United States topos on my phone without the additional cost of a GPS…that’s a pretty darn good value. 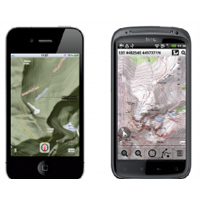 Price: Application is free to download, additional cost for purchasing topographic maps. 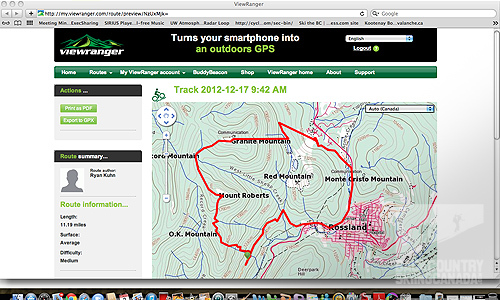 The Viewranger is a useful map application that is intuitive to use. It’s remarkable selection of open source maps and government-issued topographical maps (for purchase) are what really stands out for this product. 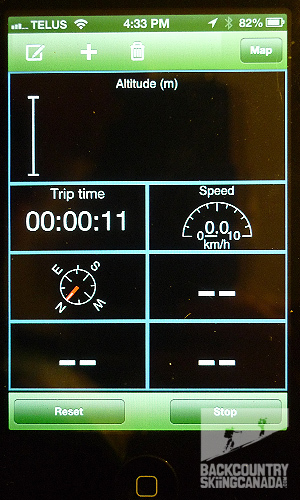 I have used it for both pre-trip planning as well as route tracking and navigation in situations of poor visibility. It is a good tool to have in your pocket. The Viewranger wasn’t designed for skiing specifically and therefore lacks some ski-specific functions such as number of runs. While this can be unlocked in the Trip View mode, it would be nice to see “modes” for specific activities such s skiing added to unlock the full potential of the application more easily. Also, when in track mode the View Ranger uses up the battery life much quicker. The View Ranger site has a list of ways to minimize this battery drain, but at the loss of the tracker function. 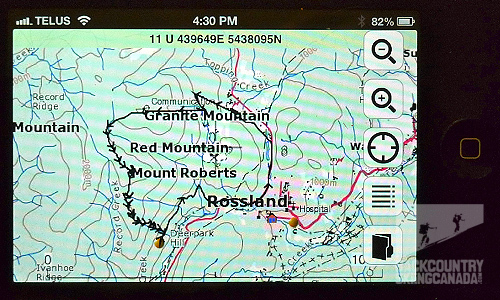 Ultimately, the View Ranger app should not replace having a traditional compass and map, and knowledge of how to use them.